The work we do does not get accomplished without the help of our donors and supporters. 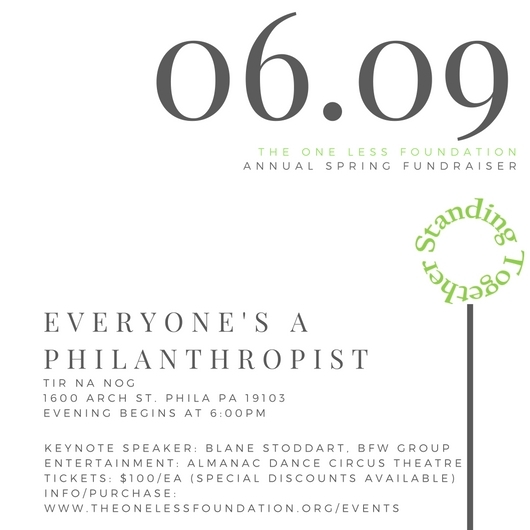 Join us at this years' Everyone's A Philanthropist spring fundraiser and see how we are Standing Together, with you, and with those we support with our programs to create paths out of poverty. Come learn how all of us standing together makes a difference and hear from those who have been helped and supported by our organization, while enjoy great cuisine and a specially created one of a kind performance by Almanac Dance Circus Theatre. Early bird discounted tickets are available until April1st. You can also take Uber on us, after purchasing your ticket contact us (info@theonelessfoundation.org) and we'll send your our special code for a free ride with Uber. We'll see you on June 9th! (Attire for the evening is cocktail/dressy casual) and yes tickets can be purchased at the door. We apologize for the late notice in the change of dates for our event; however due to unforeseen circumstances we are moving this year's Everyone's A Philanthropist to Saturday June 9, 2018 from the originally scheduled date of May 5, 2018.